canopies (Yang et al., 1993); (2) models based on fisheye (hemispherical) photos from below the canopy (Grant and Heisler, 1996); and (3) mathematical models that describe the canopy as a series of ellipsoidal shapes of specified porosity (Gao, 1997; Gao et al., 2002). 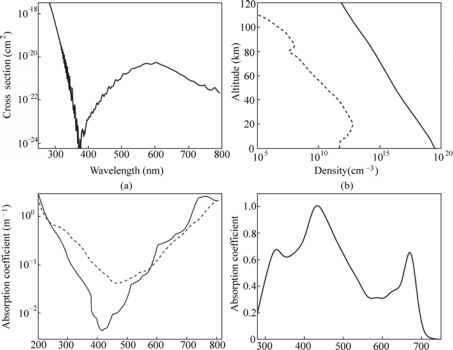 where t is the canopy transmission function for a given wavelength band (UV-B, PAR, and total) at a given depth designated by the cumulative LAI downward from the top of the canopy, and k is the corresponding extinction coefficient for the profile. Yang et al. (1993) measured the profile of LAI and irradiance on the horizontal by moving radiation sensors and a canopy analyzer up and down through the canopy on a telescoping tower with a self-leveling platform for the sensors. Average total LAI of the forest was 1.69; measurements were made in late August, after the forest had been partly defoliated by insects earlier in the summer. By regression analyses, Yang et al. (1993) found k values of 0.86, 0.79, and 0.64 for UV-B, PAR, and total solar radiation, respectively. Thus extinction decreased in the order UV-B, PAR, and total global radiation. To model irradiance on horizontal surfaces, I hor, at locations below non-uniform tree canopies, Grant and Heisler (1996) explored some relatively simple methods based on tree and sky view factors determined from hemispherical photographs (Fig. 12.2). The photographs were analyzed manually to estimate sky view by projecting the images onto a grid with radii and concentric zenith angle circles at 10° intervals beginning at 5° of sky zenith and azimuth, and then counting the number of grid intersections that fell on open sky. Measurement results for these sample locations beneath the street trees are presented in Table 12.2.
where Fdiff was the diffuse fraction (0 to 1) of total global radiation. In the UV-B, F^g- varies with atmospheric aerosol content, and though Grant and Heisler (1996) assumed aerosols to be a constant average value in their model, they estimated that over the range of possible aerosol content with clear skies, errors in aerosol content could lead to errors in estimated Fdif of about 12% for UV-B and 16% for PAR. The TOC could also affect Fdiff, though Grant and Heisler (1996) estimated that for a SZA of 40°,and TOC ranging from 250 DU to 450 DU (Dobson units), which is about the maximum range for northern mid-latitudes, Fdiff would vary by approximately 2%. where fsky>g was the sky view within each 10° band of sky zenith, Wg was the normalized sky radiance for the band (^Fg over the nine bands = 1), and the summation of the right side of Eq. (12.4) is over the nine bands. The term Wg was derived by applying a previous model of UV-B and PAR sky diffuse radiance distributions for clear sky conditions as functions of zenith and azimuth relative to the sun location (Grant et al., 1996; Grant et al., 1997a). For evaluation of the benefit of including the anisotropic sky radiance, Tcanopy was also modeled with sky radiance assumed to be uniform across the sky. where Pdir was the sun fleck probability of the crown through which the direct beam penetrated, and again, the summation is over the nine bands. The Pdir term was estimated by analysis of hemispherical photographs. The three different modeling methods showed moderate success in matching measurements. When measured, Tcanopy was either less than 0.2 or greater than 0.9; the match was within 0.10. The mean bias error was generally low; in the UV-B it was + 0.106 for the bulk model, - 0.04 for the zonal model with anisotropic sky, and - 0.012 for the generalized model. However, in the mid-range of measured Tcanopy, deviations of modeled values from measured values were as large as 0.24 for the generalized model and even larger, up to 0.31, for the bulk model. Some of the modeling error is most likely caused by the rather course 10° photo analysis. Using the Gap Light Analyzer Program (Frazer et al., 1999) to determine sky view would probably increase modeling accuracy. A study using GLA analysis to estimate UV irradiance in below canopy spaces in Baltimore, MD is currently underway (Heisler et al., 2003b). The study will be based on data from hemispherical photos taken from the centers of urban-forest-inventory plots (Nowak et al., 2004). By using tree cover from urban tree inventories (Nowak et al., 2004), and assuming that tree cover is uniformly distributed, estimates of average UV-B exposure across urban neighborhoods with differing tree cover can be derived from above-canopy irradiance models (Grant and Heisler, 1999) and from the transmission model of Gao et al. 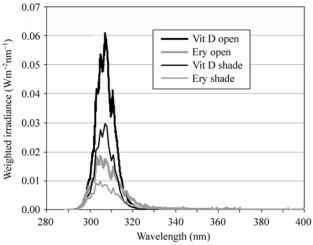 (2002) for UV irradiance below canopies of assumed ellipsoidal shaped crowns. Initial estimates indicate that for a mid-latitude city, average UV-B relative irradiance ranges from 0.33 in single-family residential neighborhoods to about 0.60 in parks and neighborhoods with multiple family dwellings (Grant and Heisler, 1999). This method predicted that in Baltimore neighborhoods consisting of high density residential buildings, with mean tree cover of 20%, there would be an average of 5.0 MED of erythemal radiation over the area between the hours of 10:00 to 14:00 during summer months. In mid- and low-building-density neighborhoods with an average tree cover of 32%, only 3.9 MED of erythemal radiation would be available for exposure to pedestrians during that same time period (Grant et al., 2004; Heisler et al., 2004). Average cloud cover was included in the modeling. According to assumptions of Webb and Engelsen (2005), fair-skinned individuals with one-fourth of their body exposed would require about one hour of exposure to acquire a recommended daily 1000 IU of vitamin D.